When you are in high spirits to click your beloved video on YouTube, a YouTube black screen/box pops up and tells you "YouTube video won't play now". What a bummer! You would fail to catch up your favorite YouTube videos and still tolerate the torturing YouTube black screen/box. I know it's difficult to understand this feeling for those people who don't have this kind of experience. But I do, and I can't bear this maddening YouTube playback problems. So in a bid to liberate myself as well as other guys who once encountered this YouTube problem like me, I spend hours googling/researching and gather almost all the useful solutions to YouTube playback error. And it's workable for me, so I guess it's high time to share these helpful solutions with your guys. 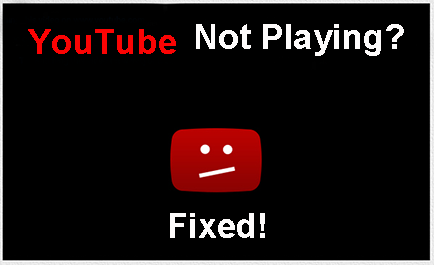 Prior to get down to the solution to YouTube playback error, it's reasonable for us to figure out the possible reasons to result in YouTube won't play. Reason 1: YouTube source video: if it's valid to playback this video on YouTube since YouTube rejects the unhealthy and illegal content video to playback on YouTube. Reason 2: network connection: if your network connection functions normally and your internet speed is fast enough to guarantee YouTube video smooth playback. Reason 5: Brower problem or other settings you might miss out. Actually YouTube black screen/black box problem probably covers a wide range of reasons. It's sort of verbose to list out all of them. After all, we care more about the effective yet easy-to-conduct solutions. So now let's get into the business. Grounded on the trial-and-truth methods from various help-discussion forums and the aids from our technical supports team, here collects the most effective solutions for you to fix playback error on YouTube. The following workarounds to "unable to play YouTube videos" issue range from the ease to the complication. You can pick out the most suitable one to have a try first. Solution 5: Delete temporally internet files, cache, cookie and history from Internet option and restart your computer. Solution 6: At times, just go to YouTube page→Select Settings→Select Sign Out, which really works for some Firefox users on Mac. Solution 3: Update your Adobe Flash Player or Shockwave to a newer version (by the way, ensure to enable them). Solution 4: Use Safe Mode, disable Adblock Plus and Hardware Acceleration, for such software would cause conflicts with YouTube. Solution 7: Try changing the DNS to one of the ones available for free. It did solve YouTube won’t play problem for certain people according to the users messages left on forums. Solution 8: Go to your display/graphics properties (right click on the desktop) and either lowering your resolution or your color quality usually from 32 bit to 16 bit (for Safari users, you can set in 32-bit mode). 1. Firefox users: Go to > Tools > Quick Preferences > Edit Site Preferences > Network tab > Browser Identification > Identify as Firefox. 2. Delete a secondary Flash player called "Gnash". 3. One way to get around YouTube unable to play videos problem is a VPN for CenturyLink (somewhat regret VPN is of charge with $6-9 a month). Fix YouTube Black Screen/Black Box with Online Solutions, Ever Thought about Offline Solution ? The aforementioned solutions are all suitable for getting around YouTube playback error online. And if the online solutions are seemingly a tad convoluted for you? If so, then I will give you a once-for-all super-easy way to fix this YouTube blank screen black box won't play problem offline. That is downloading YouTube video from YouTube with original video and audio quality reserved so as to let you free from the annoying browsers, settings, add-ons, blah blah blah. To make this become reality, you need a user-friendly yet reliable YouTube downloader to assist you. From the feedback of loads of users, they highly recommend the award-winning MacX Video Converter Pro to serve for you, since it can deliver the seamless performance to download and convert any YouTube video (720P, 1080P, 4K UHD) to MP4, MOV, AVI, MKV, AVCHD, WMV, MP3, etc. at one stroke with 83X faster speed and intact quality. Thus you can playback your favorite YouTube videos without YouTube black screen/black box or the other worse YouTube playback issues. Watching YouTube videos on iPhone 6/6 Plus, iPad Air 2/mini 3 offline is also the one you can gain from this best-ever YouTube downloader & converter as it's inherent with up to 280+ profiles offered. You can smoothly playback YouTube videos on any Apple Android device at your will. YouTube Troubleshooting: YouTube Error Problems Fixed! YouTube Live Stream Not Working Problem Solved! Let's Fix YouTube No Sound/Audio Issue Now!